Casa de Kids collects personal information upon a visitor’s request to subscribe to our newsletters and announcements. Casa de Kids also collects personal information about donors in connection with their donation; we will NOT sell, share, rent or trade this information to a third party, nor send donor mailings on behalf of other organizations. Casa de Kids provides email updates to keep interested visitors to our website informed of developments and events related to our Mission. In order to receive these updates you must provide Casa de Kids with your name, postal address and email address. This information will be held confidentially, and Casa de Kids will NOT sell, rent, trade or otherwise reveal this information to a third party. You will be given the option to remove your name from our email list at the bottom of each email update. Your online donations are safe and secure. 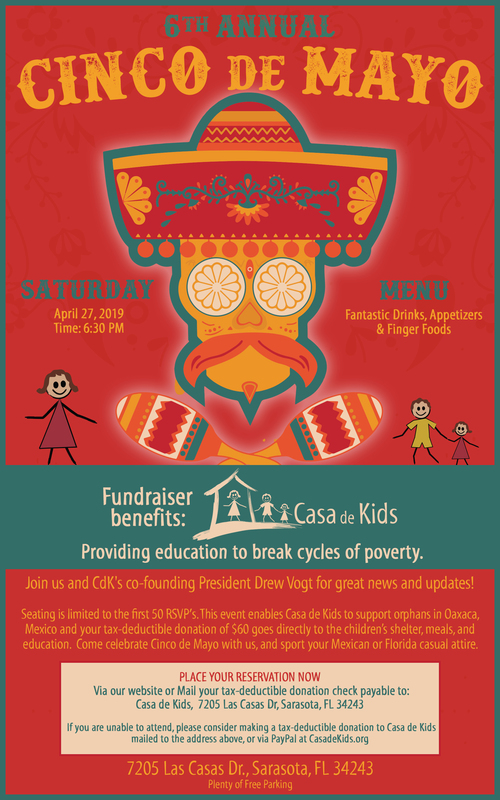 Casa de Kids’ Donate button is supported by industry-standard SSL (Secure Sockets Layer) encryption to protect the confidentiality of your personal information and the security of your transaction during transmission. For all donations made through our website with credit/debit cards, we will not store or retain information after the transaction is processed. At your option, Casa de Kids makes available PayPal to process donations. When you make a donation via PayPal on the Casa de Kids web site, your personal information is subject to PayPal’s data collection practices. For a full description, please read PayPal’s privacy and security statements. No data transmission over the Internet, however, is 100% secure. While we strive to protect your information, Casa de Kids cannot ensure or warrant the security of such information. that accompanies your online donation. If you donate online, Casa de Kids will never sell, rent or trade this information to a third party. Casa de Kids may collect information about your computer, including where available your IP address, operating system and browser type, for system administration. This is statistical data about your browsing actions and patterns, and will not allow Casa de Kids to identify you as the user. from our site as a service to our users and we are not responsible for the content or information collection practices of those sites. We have no ability to control the privacy and data collection practices of such sites and the privacy policies of such sites may differ from Casa de Kids policies. Therefore, we encourage you to review and understand the privacy policies of such sites before providing them with any information. Casa de Kids does not intend, and this website – or any part of this website – is NOT designed to collect personal information from children under the age of 18. If you are under 18 years old, you should not provide personal information on our website or use this site without the supervision or authorization of an adult. In addition, please note that children under the age of 18 may not make donations on this website without parental consent. To ensure that the Casa de Kids web site is presented in the most effective manner for you and for your computer. Casa de Kids does not use your personal data for marketing purposes. Casa de Kids may disclose your personal information to third parties if we are under a duty to disclose or share your personal data in order to comply with any legal obligation, or in order to enforce or apply any other of our agreements; or to protect the rights, property, or safety of Casa de Kids, our visitors, subscribers, donors, or others. This includes exchanging information with other companies and organizations for the purposes of fraud protection and credit risk reduction.